Seated in a pew at North America’s largest Roman Catholic church, Robin McLaughlin smiled. “I’m excited for my young women to be a part of something great,” she said. 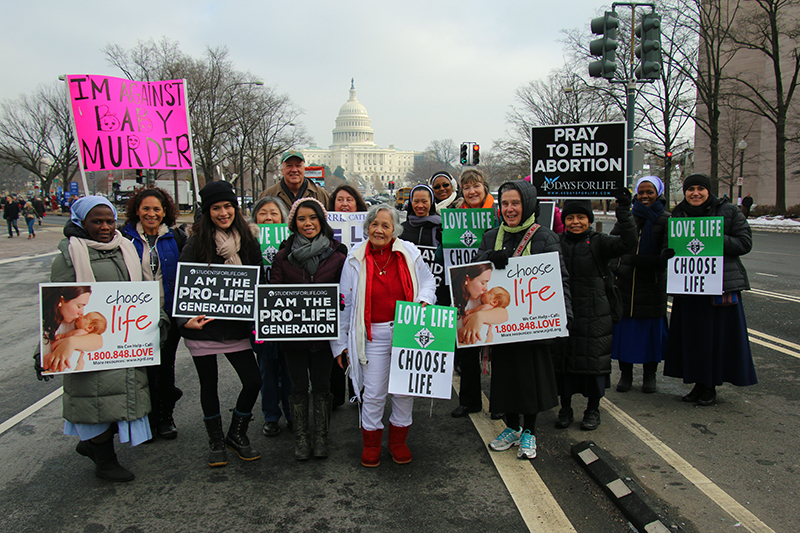 A member of St. Maria Goretti Parish in Hatfield, McLaughlin traveled with two of her daughters and one of their friends to the 46th annual March for Life on Jan. 18 in Washington, D.C. Some 45 fellow parishioners joined McLaughlin and more than 3,000 Philadelphia-area pilgrims at the demonstration, which peacefully protests Roe v. Wade and Doe V. Bolton, the 1973 U.S. Supreme Court decisions that legalized abortion. For McLaughlin and thousands of other Catholics, the march was preceded by Mass at the Basilica of the National Shrine of the Immaculate Conception in the nation’s capital. Kansas City Archbishop Joseph F. Naumann, chairman of the U.S. bishops’ Committee on Pro-Life Activities, served as principal celebrant and homilist at a Jan. 17 liturgy, which was immediately followed by an overnight prayer vigil at which seminarians from across the nation led holy hours. On the morning of the march, Philadelphia Auxiliary Bishop Timothy Senior was the homilist at a special Mass in the shrine’s basilica for the Philadelphia Archdiocese’s pilgrims, whose ranks included seminarians, students from a number of archdiocesan schools, and parishioners. Reflecting on the day’s Gospel, in which Christ healed a paralytic brought to him by four men (Mark 2:1-12), Bishop Senior stressed that a commitment to life requires “going to extraordinary lengths” through “faith, action and prayer.” He urged those present to “bring those most vulnerable to the feet of Jesus,” including the unborn, the terminally ill, prisoners on death row, refugees and victims of human trafficking. “We also bring the abortionists, the technicians, those who oppose and mock us,” he said. Following the Mass, pilgrims made their way to the grounds of the Washington Monument for the noontime March for Life rally, which featured a surprise appearance by Vice President Mike Pence and second lady Karen Pence. 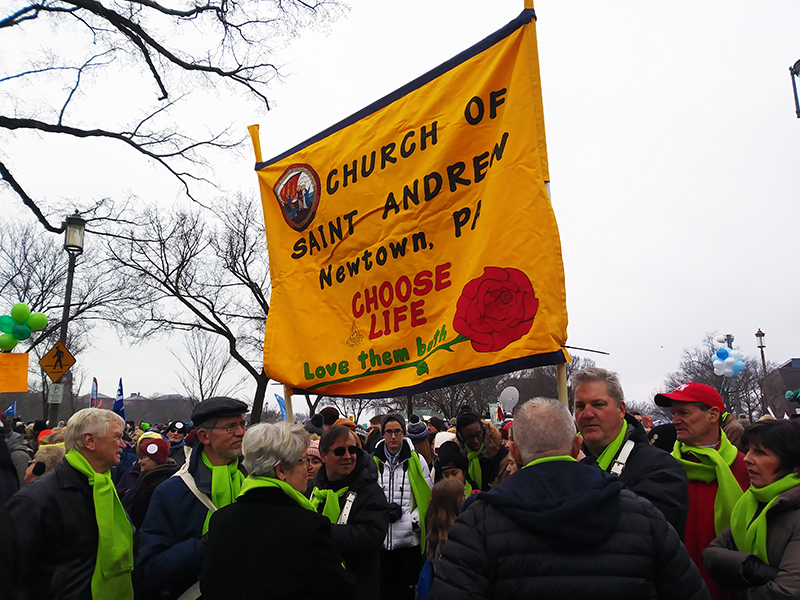 During the march itself, the Philadelphia contingent was led by Bishop Senior and Auxiliary Bishop John McIntyre, processing behind a banner carried by St. Charles Borromeo seminarians. Now in its fifth decade, the march has come to draw an increasing number of young people. Robin McLaughlin agreed. “I think it’s time for the young to join with those who are already making a stand, and let those young people’s voices be heard,” she said. McLaughlin’s daughter Valerie, a sophomore at Gywnedd Mercy Academy High School, felt the same. “As Catholic women — as young Catholic women — we’re passionate about this mission, and we all want to try to spread the pro-life message,” she said. Education and awareness are key to this effort, said her friend and classmate Mairin. 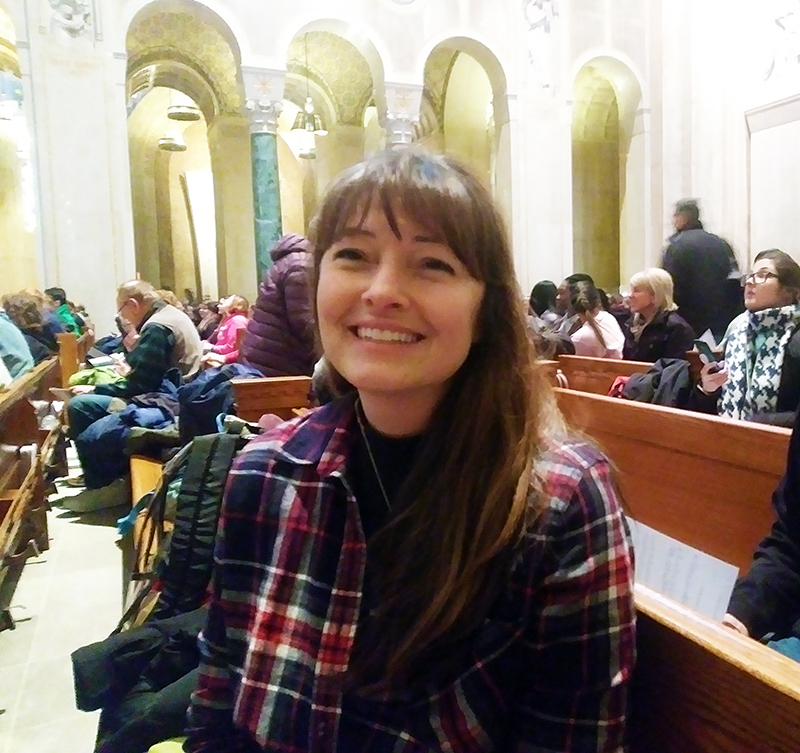 The pro-life movement advocates for women’s rights, said Megan Travaline, a Montgomeryville native and Catholic University of America alumna now working in Washington, D.C. While the nation’s laws permitting abortion need to be changed to protect the rights of the unborn, he said, the approach should be one of compassion and accompaniment, rather than strident conflict. Father MacNew added that several of his students had been trained to assist the Sisters of Life as volunteers in their crisis pregnancy outreach. One such volunteer, sophomore Lena Staropoli, said she prepared for the march through prayer. Barry Pine of St. Andrew Parish in Newtown endorsed that approach. Eleven-year-old Rachel McLaughlin echoed this view on one of the most divisive issues of modern times.